LAS VEGAS – The success of Brian Schaff’s business, Rebel Swag, is the perfect example of what can happen with hard work and dedication. Finally, Schaff – a native Las Vegan – began designing UNLV Runnin’ Rebel T-shirts in 2007. A longtime UNLV Runnin’ Rebel fan, Schaff established Rebel Swag in 2008 to put his design ideas to good use. However, Schaff quickly learned that it would take much more than a good product to get his new company off the ground. It wasn’t until Schaff met former UNLV Men’s Basketball player (and the son of the team’s coach, Lon Kruger) Kevin Kruger that Schaff caught a break. Since then, the company has formed partnerships with such businesses as Zappos.com, and Rebel Swag’s sales have taken off. Today the company designs, prints and sells UNLV Runnin’ Rebel apparel (including a backpack and towel). Unlike many fan apparel companies, Rebel Swag’s designs incorporate ideas from the university’s rich traditions and special events to ensure they are something fans will enjoy wearing, regardless of whether they are at an actual UNLV sport event. 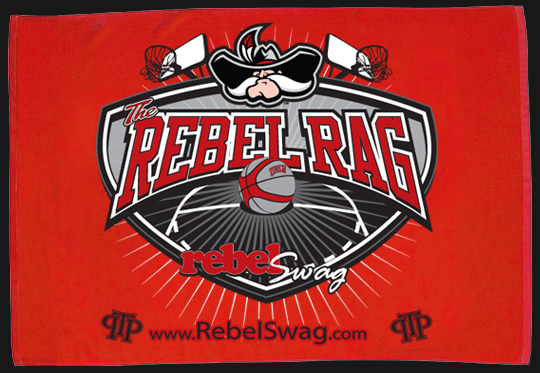 Rebel Swag is a primarily Web-based apparel company that, when college basketball season begins, can also be found at all UNLV basketball games. For more information about Rebel Swag or to suggest an idea for a new piece of Rebel Swag, visit www.rebelswag.com or http://www.facebook.com/RebelSwag.